Electrical Power System or rather EPS, has two primary functions; firstly, to monitor and charge batteries and secondly, to provide power to the bus (or core system). In case of satellite systems, a prime source of energy is the sun and solar cells help tip up the batteries. 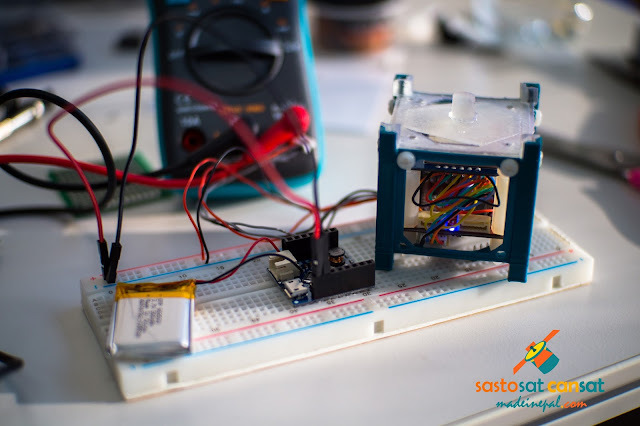 SastoSat, however, does not have a solar cell in place, at least not at the moment. It is possible to place them on sides if I do get the time but right now, that's not the priority. The battery seen above is a 3.7V 500mAh battery that is very common with small multirotor crafts. I had to hack of the cables and solder it to the EPS input directly (see below) as the connectors mismatched. I still don't understand why people don't keep a standard and use molex in everything. 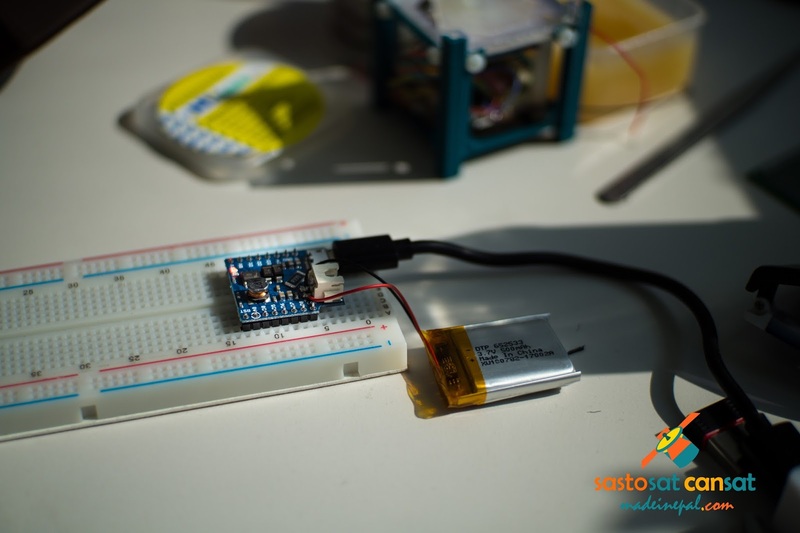 The EPS system itself is a $2 dollar piece of hardware produced for ESP8266 Wemos mini module. Since I have decided to use the mini for SastoSat High (SastoSat's version for high schoolers), I decided to integrate and check if it has the umph to power SastoSat Uni's (SastoSat version for university students) bus. 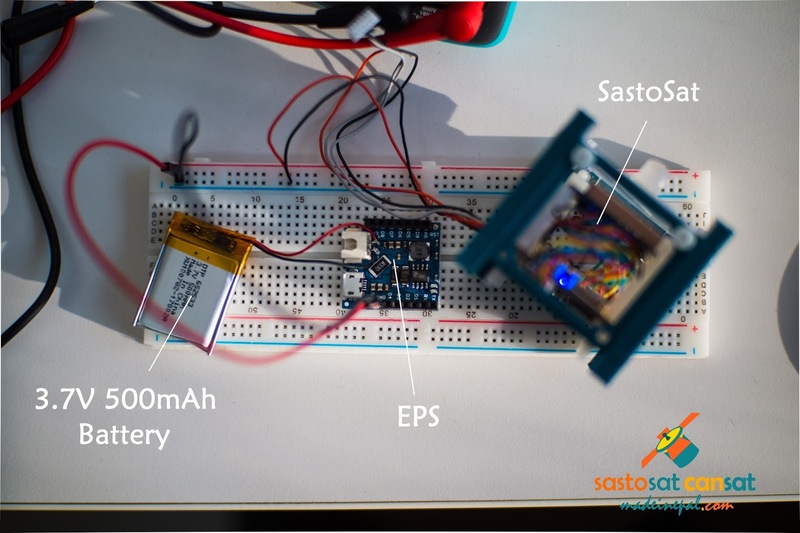 Powered it up with no problem as EPS has an inbuilt step-up regulator to increase the 3.7V to 5V. The next challenge now is to find a way to mount the EPS onto the structure. Which is tricky because there's absolutely no space. The GPS takes the top, followed by the ESP8266 module and then Pixracer. I might actually have to redesign the structure and print it again. That means it could have a dimension of 500 mm X 500 mm X 750 mm. I will just have to rework on my CAD. In the meantime though, I will probably have a post on SastoSat High before I work on the integration. Components have arrived, about time.